In recent weeks, I’ve noticed my behavior has changed when I fire up the PC in the morning. My Yahoo has been my home page forever. I love the portal approach, with everything I like easily visible and accessible with a click. 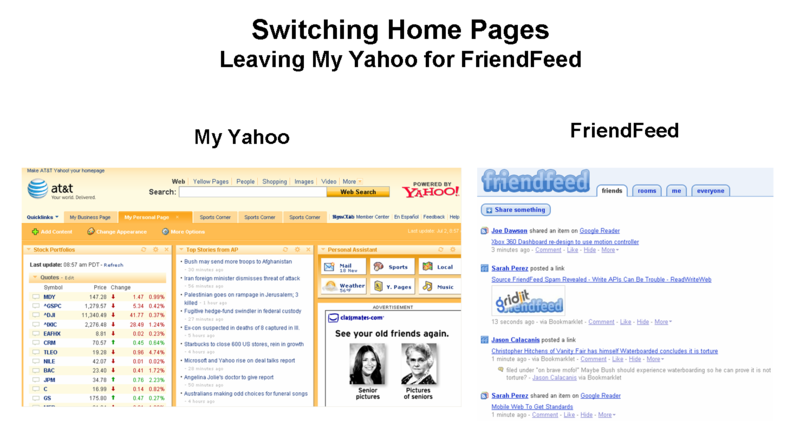 But as soon as My Yahoo loaded, I quickly clicked over to FriendFeed. I really didn’t read much of what was displayed on My Yahoo. I can be pretty loyal to apps and companies I like. I was doing this with Yahoo, despite the change in my behavior. Finally though, I realized that staying loyal and delivering a page view to Yahoo wasn’t really getting me anything. Hitting Refresh on My Yahoo only brings up the same stories. FriendFeed has the most amazing river of new stuff. I know I can control the portal experience by adding/deleting content. But that’s a pretty heavy process to me. And it doesn’t really come close to the constant stream of interesting new content that FriendFeed delivers. I don’t mind the ads so much, but that big fat Classmates.com ad sure does take up a lot of real estate. I expect when Friendfeed includes ads, they’ll be more subtle like Google AdWords. Biggest concern? I’ll fail to check my Yahoo Mail without the link I have on the My Yahoo page. A number of people still use that email to stay in touch. If Yahoo can get clever and revive itself, I might make it my home page again. But for now, it’s FriendFeed.